Cooper Cronk has played the NRL grand final with a broken scapula to help inspire the Sydney Roosters to a 21-6 win over the Melbourne Storm, who farewelled Billy Slater on a losing note. 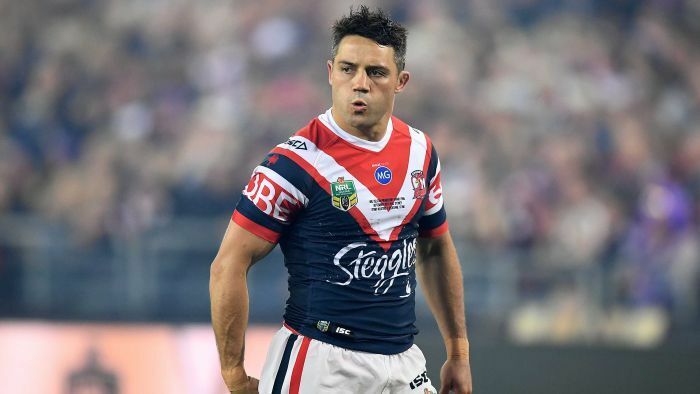 Cronk was only confirmed as a definite starter a bit over an hour before kick-off at Sydney’s Olympic stadium following a week of speculation about his injured shoulder, however the extent of the injury was revealed after the Roosters claimed victory. He was limited to orchestrating the team’s attack as he battled through the pain and he also craftily hid himself against a Storm attack that struggled to target him. Cronk missed none of his eight tackles in a courageous effort before bowing out with two minutes to go. The 34-year-old could barely lift his left arm, let alone pass, kick or tackle, yet it was the Storm that were immobilised by a rampant and meticulous Roosters attack. The Roosters were on top of the Storm early in the grand final, scoring tries through Daniel Tupou and Latrell Mitchell inside the opening 15 minutes, while a third to Joseph Manu late in the first half established an 18-0 lead at the break. The Storm did not get on the scoreboard until the 62nd minute but it was too late for the defending premiers to lay a glove on the Roosters, who added a field goal through Clive Churchill Medal winner Luke Keary and penalty goal from Mitchell to ice the victory in front of 82,688 spectators. The loss dampened Slater’s final match before heading into retirement, while Cronk enjoyed the rare honour of winning consecutive grand finals with two different clubs, having triumphed with the Storm last year. It is the Roosters’ first premiership since 2013 and second under coach Trent Robinson. With Cronk unable to pass longer than a metre, Keary and Tedesco shone. An early Mitchell penalty goal gave the Roosters first points, but Keary set up the first try with a long ball for Tupou in the eighth minute. Keary was also involved for the second, sending an early ball for Mitchell to swat aside Will Chambers and claim first points in their anticipated battle. While the Roosters were pinpoint with their ball-use, the Storm were uncharacteristically wasteful with theirs. Felise Kaufusi and Nelson Asofa-Solomona, the latter of whom eyed off Cronk before dropping the ball, came up with ill-timed turnovers in the first half. And the Roosters made them pay, like when Jake Friend took off from Asofa-Solomona’s error and it resulted in Munster being binned for a professional foul. It was the first grand final sin-binning since Terry Lamb was given a rest for Canterbury against Manly in 1995. The killer blow came just minutes before the break, when Tedesco caught the Storm napping on a short side move for Manu to score in the corner. Down three tries midway through the second half, the Storm got one back when Josh Addo-Carr intercepted a Keary pass and raced 85 metres to score. But the Keary one-pointer finished off the match, before Munster was also marched to the sin-bin a second time as Cronk was substituted from the field.